A team of student engineers from Brunel University helped design and build an unmanned, engineless toy glider in an attempt to fly over 22 miles of sea for a TV special to be shown this Christmas. In March 2012, Lecturer in Aerospace Engineering Dr Mark Jabbal received a request from Plum Pictures for a group of students to take part in James May’s Toy Stories. Toy Stories sees Top Gear presenter May making life-sized constructions of some of Britain’s best loved toys. Previous creations in the programme include a Meccano footbridge, a full-sized Lego house and a Plasticine garden. A team of 14 aerospace and aviation engineering students, both undergraduate and postgraduate, spent a week in an aircraft hangar to construct the glider. The students were responsible for assembling the wings, tail and fin and worked alongside May, a keen aviator himself, who constructed the fuselage with the assistance of an engineer. Over 1,000 pieces of balsa wood were used in the construction of the four-metre wingspan glider. 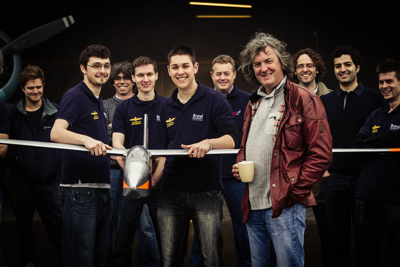 The student team were also involved in testing a full-sized replica of the glider in a wind tunnel at the University of Southampton and in carrying out computer simulations to model glider performance. With results from these activities, the students were able to propose subtle changes to the wings to improve the aerodynamics. These changes were reflected in the final glider build. The flight attempt - the first ever flight on this scale by a hand built toy glider - involved an ambitious launch from an airborne helicopter at approximately 10,000ft above sea, with an aviation student at the helm of the glider controls to avoid any difficulty during its flight mission.